Not the most catchy title for a blog post, perhaps, but that is what I have been doing the last few weeks while my blog has been very quiet. I am into one of those periods when I am not very creative, but just enjoy making simple projects with lots of mindless sewing. 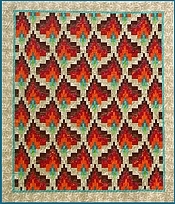 Bargello quilts fit my mood perfectly, as they come together almost by themselves while I am thinking about something else, or listening to music. This time around, I decided to also try out one of the thousands of tips that you can pick up from forums or blogs on the internet these days: joining squares for another project as leaders and enders. Using leaders and enders when sewing is nothing new, – far from it, – and I have also been doing that before, but only using fabric scraps that were thrown away afterwards. 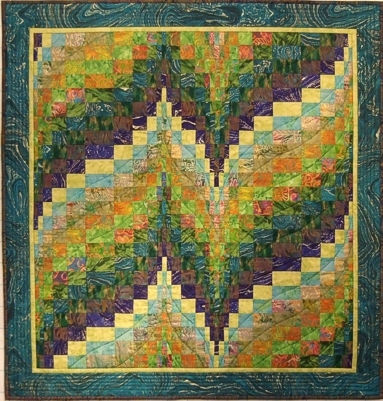 Many years ago, when making the quilt above, I cut lots and lots of 2 inch squares, and I had a box of leftover squares from this quilt tucked away below my ironing table. My plan was to join two and two of these squares as leaders and enders while also sewing the bargello quilt. I first sorted the squares into groups of obvious darks, obvious lights, and mediums. The medium group became quite big, so I sorted those into medium lights and medium darks. Then I put the piles onto two trays. On the tray to the left are the lights and the medium darks, and to the right are the medium lights and the darks. I started with the tray to the right, selecting a square from each pile to sew together in between the bargello strips. Here are two squares going in as enders. 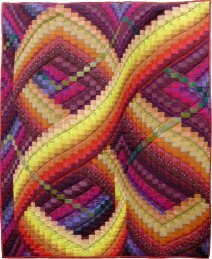 Cut off the bargello strips…. … and the squares lead on to the next set of bargello strips. There are lots of seams in a bargello quilt…..
…… and the heap of joined squares is growing fast. At the moment I am thinking four-patches, and then we’ll see what it will turn into. 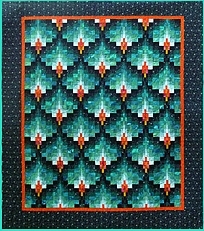 The first bargello top is finished and has been sent off to be longarm quilted. The next project is on its way…..
… and the heap of joined squares is ever growing. I have already started on the second tray.